It is habitual that test takers have a tough time with multiple choice questions, this is because they consider multiple choice questions as a stress-free set of question when equated to another type of questions and so forget to pay attention to it. Irrespective of the format of the question, test takers should concentrate on multiple choice questions a lot. Many people take a guess to answer multiple choice questions, but these type of questions require good skill and logic to answer them. 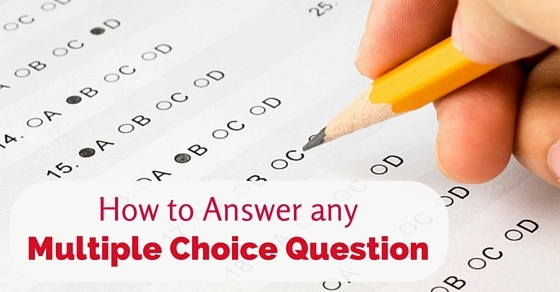 Here are a few tips on how to solve multiple choice questions. As time passed by, the complexity of the competition questions has also increased. Earlier there were only text type questions, but now people have started using graphs, pictures, scrambled images etc in multiple choice questions. These are the type of questions where we will have the option of choosing only one answer. Here the choices will be provided in radio buttons. In this type of questions, we will be having the option of selecting multiple answers. Here the choices will be provided in check boxes. How to answer multiple choice questions correctly like a pro? Multiple choice questions are mostly tricky ones. But with a little smartness we can crack them very easily. With a little knowledge on the subject and a good strategy, you can easily answer any multiple choice questions. If every step fails, be confident and do the guess work. Not every one are so comfortable answering multiple choice questions. Now if you are also in the same line, then here are few tips which will be revealing for taking up multiple choice questions. In most of the competitive cases, multiple choice questions are used as a preliminary exam. In such type of exams , for every wrong answer negative points are given. So you need to answer each and every question very carefully. Imagine the topic to think logically without looking at the options. Last but not the least, as per research your first guess will always be right. Usually the option C is implicated as the right answer in multiple choice questions. Multiple choice questions are not randomized, when asked. The best answer to guess in such question is C. It is better than leaving the answer spot blank. Like the saying goes something is better than nothing. As the probability of being the right answer is not nil, it is better to choose the questions as C (which is like a standard answer among people). The following mentioned are few multiple choice test tricks and strategies on how to pass a multiple choice test without studying. Many individuals who take up objective type questions have the habit of guessing the middle option as the answer if they do not know. They also avoid answers which show none, all, always and never. William Poundstone who is an author opens up that this conventional wisdom will never help throughout the exam and so ignoring conventional wisdom is vital for answering a multiple choice answer. For answering a multiple choice question, it is a fact that the multiple options are formatted in a tough manner. All the options seems to be right in some aspect and so the test taker can pick out the wrong answers first and then choose the right answer. When your question ends with ‘a’, ‘an’ or ’the’, then the answer should start appropriate to the article and hence correct answer can be chosen appropriately. Though this does not stand true for all questions, but can help for few which has articles in it . Few questions in English can be handled this way for picking the right option. When there are options with many variables and so, look out for the options and its patterns and similarities. Pick choices which have the same patterns and leave out the outliners so that the nearest or right answer is picked. The middle order option is something which should be chosen, for example if the options are 100,150, 200, and 250 then choosing 150 or 200 can be the right choice. In such cases mostly, right answers are lesser than the maximum and higher than the lowest. Always remember that the first impression is the best one. Once you have read the question, pick the right answer immediately. As you keep on reading the options there is a chance to choose the wrong option. Practising well for exam is one way to score maximum. Past test papers, practice exams or study guides can give you an idea on how to answer mcq questions. In order to use time appropriately, answer the questions for which you know the answers. For ones which you have a doubt, leave the doubtful question and skip over, at the end again read out the questions which you have not answered and complete the question paper. By this way your confidence is elevated and you also find more time for hard questions. The keywords in the question are to be identified and underlined which helps to narrow down the meaning. By this way the right option will match each and every part of the stem of the question. For the same paying attention to qualifiers, superlatives, negatives are important. Once the question is read, formulate the answer in your mind rather than looking into the options. Once you have formulated the answers, look into the options and you can find the answer you formed. You may have opted for first option based on your first impression, you can also change the answer if you think another response is right. A concrete reasoning is mandatory to make any changes and not just feeling. Playing the odd doesn’t work out all the time and so playing with such type of methods can be avoided. Guess work and game play with multiple type questions can be avoided as they do not work well all the time. It is always a good idea to learn from your mistakes. Once the paper is returned back to you, review the answers and find out the reason for the mistakes taken place. Reason out if it is the question pattern or study material which has made you to pick an incorrect answer. By this way mistakes in future can be avoided. A complete reading of the question paper is one way to find out few answers, this is because for some questions answers are found in the question itself. The questions may have a link and answers within it too. It is a good way to eliminate grammatically wrong answers in a multiple choice question. The answers would never make sense and hence grammatically wrong answers can be avoided. In a multiple choice paper, if two options are complete opposites then there is a chance that one of them might be the answer. It is actually a trick used by the professors to check the knowledge of the students in the subject. There are many questions where one word appears in more than one options. The answer must be one of those choices which have the same word. In this context eliminate the odd one and choose from the similar options. Once the question is read the options would have answers related to the question, if there are answers which are unrelated to the question then they can be eliminated as wrong answer. It is true that multiple choice questions concentrate on minute details in the subject which cannot be retained in mind effectively. Preparing at an early stage is what a multiple choice exam requires. Frequent review and early preparations are ways to hack the multiple choice exercises instead of tricks and guess work. It is mandatory for intense preparation for any multiple choice paper, it would be advisable to pay attention to terms and concepts, observations, ideas and lot more. These tips are important as this would be the ones which most commonly appear in the exams. You can also make lists and tables of important ideas or events which makes learning easier. Almost all students guess most of the time for a multiple choice answers but guessing would not be apt for negative marking questions. Avoid guess work for negative marking questions as they may lower your final total. These are a few hints which can be followed for answering multiple choice questionnaire, but these tips are not complete100% true to yield successful results. These are a few tricks to handle the questions. They work for some situations but not completely for all exams, all time and all scenarios. Prior preparations and training are mandatory aspects for any multiple choice exams. The skill to tackle a multiple choice test paper is mandatory and hence good preparation on the subject along with these techniques is required to win over such exams. Test takers and students can run through these tips with proper preparation and hack their multiple choice exams in the right manner rather than believing in guess work.